Cabbage is propagated from seeds. The land should be clean cultivated eight weeks before planting and the ground must be ploughed deeply, immediately before planting, with a disk harrow or other suitable implement to a depth of 450 to 600 mm. The soil should be fumigated two weeks before planting time if necessary, to control nematodes. Cabbage may be planted by direct-seeding or transplanting of seedlings. If direct seeding is to be used, about 2 kg of seed per hectare may be required. Seedlings should be transplanted as soon as they reach the desired size and only well-hardened, young, stocky plants should be used. Transplanting is done on moist soil. The soil around the roots should be firmed and irrigated as soon as possible after the seedlings rare set. 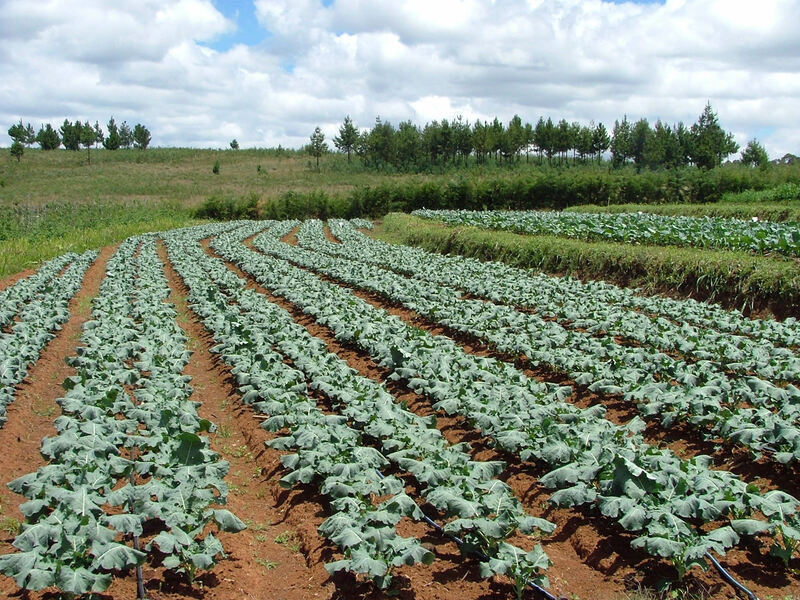 In wet areas, cabbage should be planted on raised beds or ridges to reduce water-logging and stem or root rot diseases. Plant population and spacing influence head size, head shape and yield. Cabbage plant populations vary according to the target market for a particular crop. It has been reported that cabbage forms smaller and slightly more pointed heads when they are spaced closely. You need 150g of seed per acre if you are going to use seedlings. 1 week before planting, add a 7 cm layer of compost or well-rotted manure. Use 1 wheelbarrow full of manure for every 3 square metres. Mix into the soil. Water the bed. Raise the nursery bed 15-20cm high and 1 metre wide then level well. Make small drills 3cm deep and 20cm apart, by hand. Soak the seeds in mixture of 50g PEARL in 20lt water just before planting them. This will prevent soil borne diseases attacking seedlings. Your seeds will start to germinate after 5-7 days. Remove the grass and put a shade over the nursery bed. The shade should be 1m high. Put grass on the top but make sure some sun light can get through. The main land should be prepared till it attains fine tilth stage by give couple of deep ploughings which also helps in removing any weeds from the field. In poor soils, supplementing with well rotten farm yard manure will increase the soil fertility hence the good yield. Transplanting holes should be dug 10cm deep at a spacing of 90 x 60 cm or 6- cm x 60 cm depending on the variety. Add rotten manure and a teaspoon of DAP (50kg NPK (Mavuno) per acre and 10 tonnes of rotten manure per hectare). Apply 5g per hole and mix with the soil so that the seedling roots don’t get burnt. Transplant the healthy and vigorous seedlings using a small shovel. Make sure you water the seedlings before transplanting. Another important point to note is to make transplanting holes first before plucking the seedlings from the seedbed. Always transplant late in the evening or during a cloudy day. Water the trenches/holes (where you will transplant the seedlings) before plaing the crops. This helps in providing moisture to the crops. If you are transplanting during a dry period make sure you mulch and water heavily every day. Drench the crops after transplanting with insecticides to prevents pests especially cutworms. If you are transplanting during a dry season make sure you water the trenches before transplanting to ensure the crops get enough moisture. Weed your field 2-3 weeks after transplanting. Weed with care using a jembe to avoid damage to the roots. Weeds compete for nutrients with your crop and also hide pests which carry diseases. After weeding, top-dress with a Nitrogen fertilizer. This will encourage formation of more leaves. Apply fertilizers like Mavuno Topdressing N.P.K 26.0.0 or CAN. You need 50kg per acre. Easygro Starter (N.P.K 18:20:21 + T.E): Well balanced foliar feed with high phosphorous and potassium contents hence enables seedlings develop strong rooting system. Easygro Vegetative (N.P.K 27:10:16 + T.E): Fertilizer with high Nitrogen is recommended during the vegetative phase. Spray after every harvest at an interval 2 weeks.